I needed to rearrange the pump and filter setup of our above ground pool. The only problem with the new arrangement is that the drain-hole for the filter (Astralpool ZX100) points towards the pool wall instead of away from it. This side of the pool is on the shady side, and takes a long time to dry out, so I don’t want that area getting wet unnecessarily. So I investigated the possibility of replacing the drain plug with some kind of valve or tap, so I could drain the water away through a hose. The drain plug has two threaded sections and can be removed completely if unscrewed carefully. At first I thought the plug was anchored inside the filter housing so that the plug wouldn’t come free and get lost. But the ‘anchor’ is just a second threaded section. Be careful unscrewing or re-screwing the plug – it would be easy to cross-thread it. It was difficult to find a suitable valve to replace the plug. 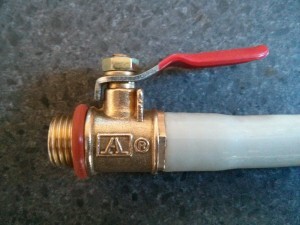 The plug appeared to have a 1/4″ BSP thread. (But a lot of pool equipment is designed in or for the USA so there was a real possibility the thread was actually the US equivalent: NPT). This is pretty small so I was looking for a tiny valve. I wandered around Bunnings for some time without much success. 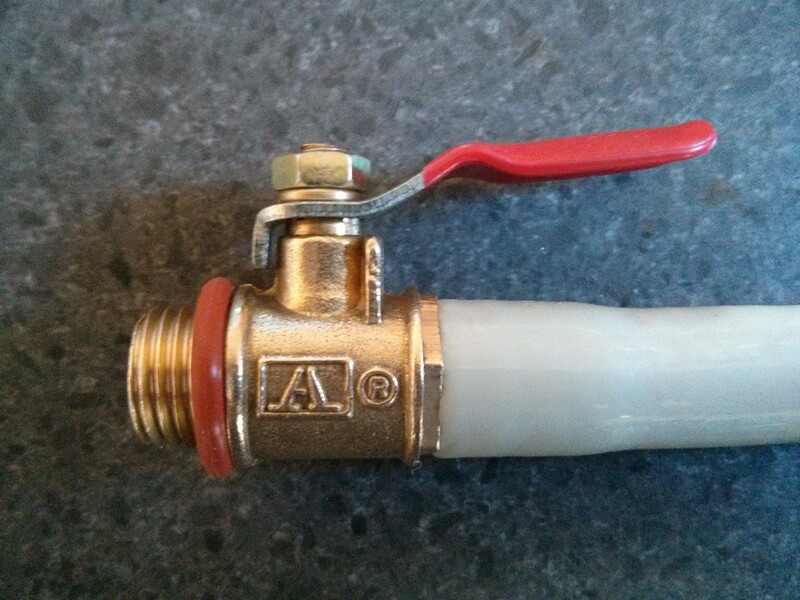 I was looking for 1/4″ BSP male on one end and a barb on the other to attach a piece of hose. Actually at first I had many possibilities in mind, including some sort of bulkhead fitting for the inside of the filter case and a female threaded valve outside. I also thought of using a home brew kettle valve but they are expensive. I couldn’t find what I wanted so I searched ebay and eventually found a 1/4″ BSP to barb brass ball valve. It was only $3 including postage from China. Designed for use in either pneumatic or hydraulic systems it should be able to handle 12-15 psi of slightly salty water. It took a while to arrive from China but it fits perfectly. I thought I may need to use some teflon tape on the threads but so far the rubber o-ring from the plug is making a water-tight seal. 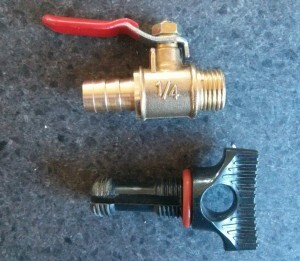 The new brass ball valve and the original ABS drain plug. I attached a piece of hose from an old washing machine. Ready to screw into the filter housing. This entry was posted in Gadgets and tagged Filter, Pool, Pump on August 1, 2014 by Steven.